So summer has officially arrived in Australia and it’s getting hot! While it may seem like the easiest option to stay cool is to crank your aircon, it might not be the most cost effective way, and definitely not the best for the environment. Even with carbon tax gone, energy is still costing an arm and a leg. So to save you money during the next few months I have include 8 low-cost ways to keep your home nice and cool. If you don’t already have blinds or shades installed on your windows, consider doing that this summer. By shutting your blinds and curtains during the day you will help block the sun’s heat from warming up your home. During the night the weather tends to be much cooler. If this is the case where you live, make the most of these refreshing hours by opening your windows a few hours before you sleep. Be sure to close your windows and blinds the next morning to stop the heat from letting in. Close your windows during the day may seem counterintuitive but this will stop the heat from warming your home. When you shut your windows and close doors to unused rooms you will find your home feeling much cooler. Don’t forget to reopen them at night to allow the nice cool night air in. Awnings can save you money on energy bills by cutting down on the heat your house absorbs. Not just this but also provide shade to outdoor areas giving you invaluable protection from sun and heat exposure. By shielding your home from the sun’s rays, you’ll cool your home down and have the option of enjoying refreshing time outdoors without overheating. Incandescent lights may produce a lot of lighting but they also put out just as much heat. This means by substituting your incandescent lights with cooler light emitting diodes (LEDs) or compact fluorescents (CFLs), you will be able to not only save energy but also keep your home cooler. When you use your fans strategically you will find they do a great job cooling your house down without the need for your AC. When it comes to your ceiling fans ensure it’s running in the right direction, counter-clockwise. You want to feel the breeze from your fan blowing down. This will help keep you cool during sleep time. And remember a ceiling fan cools people, not your room so switch it off when no one is there to save energy. When using appliances that give out large amounts of heat you will find it won’t take long for your home to get really hot and stuffy. To save using the aircon, try doing your laundry, ironing and even cooking in the cooler parts of the day. Especially if your have a gas stove, try grilling your food instead or simply make meals that don’t require cooking like salads, sandwich’s, smoothies and juices. Additionally you can even consider cooking bulk meals or large quantities of grains once a week to save time throughout the week and reduce your need to cook during the day. If you’re sick of paying so much money from running your aircon it might be worth to invest in longer-term adjustments to keeping your house really cool during summer. Some of these include installing insulated window films and attic insulation/fanning. You could also plant tress strategically to stop the sun beating down on your home. Bottom Line: If years ago our ancestors could survive without aircon than we definitely can as well. Just think smart and you’ll be able to keep nice and cool this summer without spending much money at all. Discover how you can reduce your carbon footprint when doing your next renovation. Everyone likes to have wooden floors in their homes but due to its large effects on our environment and our forests it makes it hard to rationalize the purchase. But what if there was a way to get the same beautiful timber look without damaging the environment? By choosing recycled timber over new timber, you’ll able to have the same feel as fresh new wood while conserving the environment. Just like new timber, recycled timber retains the heat, which means you’ll be warm and cosy in winter, cool and refreshed in summer. And the best part is you’ll be paying a fraction of the cost for it while reducing your carbon footprint. And a quick treatment with a floor sander and quality floor polish will bring back the natural beauty of the timber. Below are the top 4 reasons why you should consider recycled timber for your next project. Did you know that by purchasing recycled timber floorboards you are helping stop truckloads of timber going into landfill and decomposing to emit harmful methane gas into our environment? You will also be reducing your carbon footprint by decreasing the amount of timber needed to harvest for new timber floorboards. That means manufacturers can use recycled wood, which has previously been discarded rather than harvesting new lumber from the forest. And the more people that choose recycled timber, the better chance our forests have of recovering. It helps raise industry and consumer awareness towards deforestation as well as encouraging timber mills to adopt more environmentally friendly practices. Purchasing recycled timber floorboards saves you money. Did you know that new timber is 4 times the cost of recycled timber? So recycled timber could be the very reason you can afford your next renovation. Recycled timber has a unique beauty, which can’t be found in new timber. This is also a reason for its growing demand. If the timber was erected before the controlled logging came into place, then there’s a chance you’ll have wood that came from an ancient forest, therefore making it unique and superior. Your recycled timber will also have a finer grain pattern when compared to new timber that has especially been grown for lumber. Not to mention recycled timber is rich in character with its myriad colours and features, making it a reason to choose over new timber. Most people aren’t aware but recycled timber is far studier than new timber. This is because new timber still has a lot of moisture, even after it’s placed in a drying kiln to remove its moisture, there is still some left remaining. However with recycled timber, they are exceedingly dry and contain best part of zero moisture because they have been able to dry naturally for years. That means recycled timber floorboards will be longer lasting and harder wearing, and less prone to rotting. This is why it’s a great choice for your next renovation. Bottom line: Recycled timber is becoming growingly popular over new timber because of its positive impact on our environment. Not just this, but it’s saving you money and saving our forests. So if you want to reduce your carbon footprint choose recycled timber. It’s preserving our forest and protecting our environment. Which kitchen appliances you should use in order to minimise greenhouse gas emissions is not as straightforward as you would expect. In fact, whether you should choose gas or electric depends completely on where you live and how your local power plant produces electricity. As we can see in the below table (courtesy of etool.net.au), gas cooktops yield almost 8 times more greenhouse gas emissions compared to induction cooktops in Sweden, where renewable energy sources produce the bulk of the country’s total energy. In Australia, where coal burning is the major source of electrical energy, cooking with gas cooktops result in about one third of the emissions as cooking with an induction cooktop would yield, even if the transfer of energy is less effective. When it comes to ovens, it is a similar story, with gas ovens in Sweden resulting in about 4 times higher levels of emissions when compared to an electric oven. In Australian states that rely heavily on coal burning, the use of gas oven result in up to one fifth of the emissions as an electric oven. It is no wonder that gas fitters in Australia have plenty of work on their hands. Regardless of your choice of appliances, there are some steps we can all take to minimize energy usage when cooking. Putting a lid on the saucepans will trap the heat in the pan which would otherwise rise up and escape, which can halve the time involved in bringing water to a boil. And when it is first boiling or simmering, a lid on the saucepan will enable you to turn the heat down, saving even more energy. Also ensure that the oven seal is in a good condition and not letting unnecessary heat out, and minimise the amount of times you open the oven door to inspect the food. Choose the right size saucepan or frying pan for the job. The bigger the saucepan is, the more energy is required to heat the contents. Choose as small as saucepan as you can for the job. Saucepans with flat bases will also have a better connection with the hot plates than a rounded base, meaning that less energy will be wasted. Whether you are boiling, frying or roasting, overcooking meat and vegetables does not only reduce the satisfaction of the meal, it wastes energy. Cook your food just right and turn the heat off as soon as you can, and you will enjoy a better meal while saving energy. Consider purchasing a roasting thermometer for roasting meat, to easily check when the meat is cooked to your liking. Microwaves use far less energy to cook or heat the food. However, microwaving as a cooking alternative results in less than satisfactorily results in most cases. Though microwaves are great for reheating purposes for some types and food, and also boiling rice. Most of us love travelling to experience different countries, experiencing unique natural and historical sights while embracing or observing the local cultural traits. As responsible travellers and guests to these destinations, it is essential to treat these unique locations with respect so that our descendants will be able to enjoy these historical sights in the same way. This article aims to provide a handful of good tips on how we can reduce our negative footprint while travelling by reducing waste and use of products and services that can damage the environment. Your mode of transportation depends entirely on where you live and where you are going. Travelling in Europe can easily be done by trains, while Australians going overseas have few options except for planes. When travelling longer distances, it is difficult to find an alternative to planes. Keep in mind that some types of planes are more emission friendly than others, with the Airbus 380 having a fuel efficiency of 3.9 L / 100km per passenger. This makes it more energy efficient to fill up the last couple of seats on a plane than to drive a petrol-based car (depending on the amount of passengers in the car). When visiting other countries, take the time to research what environmental issues they are facing. Some countries might be experiencing drought, waste management issues, greenhouse gas emissions and more. As a visitor to the country, you might not have to live with the problems after you leave, but taking a responsible approach by reducing water usage, waste and CO2 emissions, you will do your part in helping the locals combat these issues. Different countries have different methods and habits of recycling. Research what the locals do in recycling matters, and take steps to reduce the amount of waste you leave behind in each country. Invest in a good reusable water bottle so that you do not leave countless of empty plastic bottles behind on your travels. 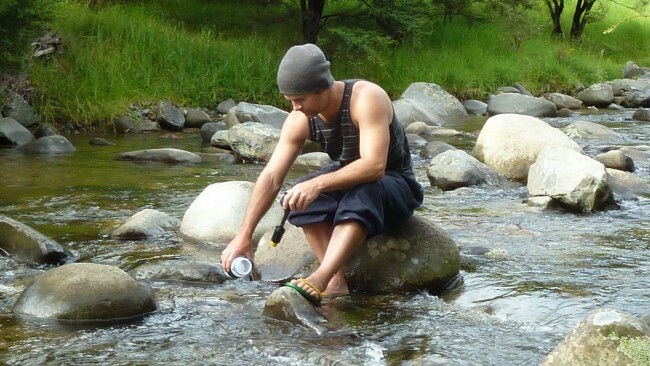 If you are concerned about the water quality in that country, a quality filter bottle such as the Fill2Pure travel bottle will leave you with safe clean water wherever you go, as it filters virus, giardia and other bacteria and any chemical waste that might be present in the local water supply. Purchasing reusable batteries is another good tip for those reliant on batteries for powering electronic equipment while travelling that will save both environment and money in the long run. It has become increasingly easier to find green hotels the last few years, with a variety of websites such as environmentallyfriendlyhotels.com only listing hotels that are committed to sustainable development. Most modern hotels also ask you to leave the towels in the bathtub if you want them washed. If you only wash your own towels once per week at home, why do you need newly cleaned towels every day when you stay at a hotel? A good tip to reduce waste when dining overseas is to dine in the restaurants rather than getting takeaway meals wrapped in packaging and Styrofoam containers. Dining in local restaurants rather than globally known fast-food chains also ensures that the money from tourism benefit the local population and restaurateurs rather than multinational corporations. To further reduce waste, order beer and soft drinks from tap rather than bottles and cans.